Several campaigns have been launched on Facebook and Twitter demanding Abdallah's release. Update: Since this article was written, Amina Abdallah was revealed to be a fictional character. Tom MacMaster, widely reported to be a 40-year-old American studying for a Masters degree at Edinburgh University, claimed to be the sole author of the Gay Girl in Damascus blog.CNN has not been allowed into Syria to cover the unrest and draws from social media and interviews with witnesses on the ground -- which CNN makes careful efforts to verify -- to inform its reporting. 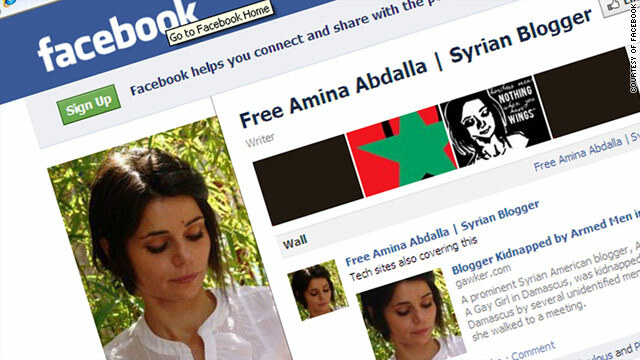 (CNN) -- A woman whose outspoken "Gay Girl in Damascus" blog has made her an unlikely icon of the Syrian uprising has allegedly been abducted. Relatives of Amina Abdallah, an English teacher seen as a prominent opposition voice thanks to international media exposure, said she was bundled into a car by suspected security agents on Monday. The disappearance of Abdallah, who holds dual American and Syrian citizenship, has prompted thousands to join online campaigns on both Facebook and Twitter demanding her release. A post on Abdallah's website written by a woman who introduced herself as her cousin said the blogger had been grabbed by armed men on her way to a meeting. "Amina was seized by three men in their early 20s," Rania Ismail wrote. "One of the men then put his hand over Amina's mouth and they hustled her into a red Dacia Logan." The claims made on the blog could not immediately be verified. CNN has attempted to contact Abdallah's family but has so far received no response. Calls to officials in Damascus and at Syria's embassy in London went unanswered. Abdallah's disappearance came as Syrian officials vowed to step up action against protesters it blamed for the deaths of dozens of security forces. Violence in three months of anti-government protests has killed an estimated 1,200 civilians. Ismail wrote that Abdallah, who has used her blog to challenge taboos in the conservative country where homosexuality is illegal but unofficially tolerated, had feared she would be abducted. Abdallah, 35, had previously written about how her father prevented security agents from arresting her for being an Islamic extremist and a foreign agent. Last month she told CNN she had been in hiding with her father since a second attempt to abduct her. In another blog post she recounted what she said was an attempt to lure her to a hotel to abduct her. In the latest blog update on Monday, Ismail wrote that Abdallah's family was trying to find out who was holding her. "We are hoping she is simply in jail and nothing worse has happened to her," she said. "Unfortunately, there are at least 18 different police formations in Syria as well as multiple different party militias and gangs." She added: "We do not know who took her so we do not know who to ask to get her back. It is possible that they are forcibly deporting her. "From other family members who have been imprisoned there, we believe that she is likely to be released fairly soon. If they wanted to kill her, they would have done so." Press freedoms watchdog Reporters Without Borders says Syrian security officials have arrested numerous bloggers and journalists as part of a widespread crackdown on challenges to President Bashar al-Assad's grip on power. Abdallah, who says she was born in Virginia to an American mother and Syrian father, last posted to her blog on Monday -- a poem ending with the lines: "Soaring and flying/Freedom is coming/Here am I wanting/To know it one day." On Sunday she wrote about the Syrian government's efforts to block news about the uprising. "In my ever humble opinion, the regime shut down the internet out of desperation; they are beginning to really feel how far they've fallen," she wrote. "I'm not the only one who thinks that they will not be able to get back up from this." In her interview with CNN last month Abdallah said the reaction to her blog had been "almost entirely positive." "A whole lot of long time changes are coming suddenly bubbling to the surface and views towards women, gay people and minorities are rapidly changing," she said.